According to a study on sources of energy and nutrients in the diets of infants and toddlers published in the ADA, infants and toddlers are beginning their lives with a diet that leads to obesity. The daily food intake of most 12 to 24-month-old toddlers mirror that of a typical adult, including high levels of sugar-sweetened beverages, cheese, processed meats, and even cakes, pies and other baked goods. Today, toddlers labeled “picky eaters” are sometimes prescribed a diet of Pediasure to “help them meet their needs” for growth. And, unfortunately, with this chocolate shake, their taste buds are groomed for junk, not exposing them to the many natural and healthy variety of tastes that minimally processed foods provide. If it’s not Pediasure it’s a steady diet of nitrate-rich-carcinogen-causing chopped hot dogs or chicken nuggets. Just read most restaurants’ kids menus to know what NOT to feed your kid. As toddlers get older, there can be an increased reliance on fortified foods such as juice and excess cereal consumption for vitamins and minerals. As parents, we need to take a step back and research the right questions to ask our healthcare provider. We can help our kids and caregivers choose what qualifies as “real food.” It’s important to avoid the over-reliance of fortified foods, fake foods, and supplements to meet kids’ vitamins and minerals needs, as excess nutrients can be very harmful and lead to imbalances. Does Your Child’s Diet Make the Grade? 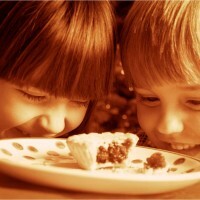 Join us https://www.facebook.com/SuperKidsNutrition for daily fit nutrition tips to keep you and your family healthy!